Havering-atte-Bower is a village and outlying settlement of Greater London, England. It is located in the far north of the London Borough of Havering, on the border with Essex, and is 15 miles (24 km) northeast of Charing Cross. It was one of three former parishes whose area comprised the historic Royal Liberty of Havering. Havering-atte-Bower has been the location of a number of palaces and large houses including Bower House, The Round House, Pyrgo Palace and Havering Palace. The name is recorded in the Domesday Book of 1086 as Haueringas. The last syllable is the only clear difference in pronunciation as v was written as u in Middle English and Anglo-Norman orthography. It is an ancient folk name meaning settlement of the followers of a man called Hæfer. The name is recorded as Hauering atte Bower in 1272. The atte Bower suffix means at the royal residence and refers to Havering Palace, which was situated here. The West London equivalent to Havering-atte-Bower is Old Windsor in Berkshire, which had a Saxon Palace that predated Windsor Castle. Edward the Confessor would have travelled to and from his palaces at both Havering-atte-Bower and Old Windsor. Both villages are situated on high ground and have great views into London. The village is steeped in royal history. Edward the Confessor was the first royal to take interest in the area. He established a hunting lodge here, which over the years would become a palace or 'bower.' It is believed, though disputed, that he may have died in the house that he had loved so much before being buried at Westminster Abbey. The surrounding areas, including the parishes of Hornchurch and Romford, formed the Royal Liberty of Havering from 1465 to 1892. Until the 17th century, royalty used the house of Havering Palace for various reasons, adding the architectural style of the day to the expanding palace. Another palace, east of the village, called Pyrgo, was purchased by Henry VIII to relieve the now ageing Havering Palace. By the 17th century, the Royal Palace of Havering was in decline, and it was eventually pulled down. Pyrgo was also demolished later, in the 18th century. Only one set of plans exists from the original Havering Palace, courtesy of a survey by Lord Burghley in 1578. Dame Tipping School in the village was founded by Dame Anne Tipping who was daughter of Thomas Chief, a governor of the Tower of London. The school opened in 1891 and is still operating today with the same main building that was used when the school was founded, although the school has had various changes and extensions through the years . Immanuel School, on the site of the old Havering Grange, at the bottom of Orange Tree Hill, is a Christian school operated by Immanuel Ministries for children ages 3 to 16. The village green still has on display its original village stocks, while on the opposite side of the road is a pond known as "Ducking Pond", rumoured to have been used for trials of witches. Though the name of the pond suggests such a history, hard evidence is yet to be uncovered. However, there are currently plans to construct a replica ducking stool at the site. The history of the area dates back to Saxon times and archaeological finds in and around Havering Country Park suggest a Roman villa or similar structure in the area. 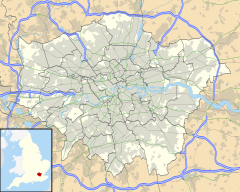 The village sits on one of the highest points in London, in the far north of the borough and near the M25 motorway. It is situated 344 feet (105 m) above sea level with striking views of east London, Essex and Kent. To the north is open countryside and to the south are the large suburban developments of Harold Hill and Collier Row. The village is surrounded by three large parks: the dense woodlands of Havering Country Park (site of one of only two redwood plantations in England, imported from California); Bedfords Park; and Pyrgo Park. The most notable residence in the village now is Bower House, built in 1729 by John Baynes, using some of the materials of the former Havering Palace. The area is on the route of the London Loop long-distance footpath. A village sign, funded by the East London Community Foundation and Havering-atte-Bower Conservation Society, was unveiled by Boris Johnson, the Mayor of London, on 3 September 2010. Transport is quite limited in this area, with only one main bus route, route 375. Route 575 also passes through the area, but this only has one return journey. 575 Harlow Bus Station to Romford The Brewery Epping, Debden, Abridge, Stapleford Abbotts, Collier Row Go-Ahead London Mon-Fri 1 return journey. Also see London Bus Routes and Essex Bus Routes. The nearest railway station is at Romford. There are frequent services from Romford Station to London and East Anglia. Both routes 375 and 575 can be used to reach here. ^ "A history of Havering atte Bower". Havering London Borough Council. Archived from the original on 27 September 2007. Retrieved 10 April 2007. ^ a b "Havering Atte Bower Liberty". A Vision of Britain through Time. Archived from the original on 1 October 2007. Retrieved 10 April 2007. ^ a b c Mills, Anthony David Dictionary of London Place Names. Oxford University Press, 2001. ISBN 0-19-280106-6. ^ "Twenty-fourth Mayor's Report to the Assembly". Greater London Authority. 13 October 2010. Retrieved 29 October 2010. Wikimedia Commons has media related to Havering-atte-Bower. This page was last edited on 17 January 2019, at 10:25 (UTC).